I am still making string blocks. As part of the Rainbow Scrap Challenge over at So Scrappy blog, Angela designates a color of scraps that we are to use each month to help us use up our stash. The February scrap color is red, and since it is Valentine month I made this Heart Strings quilt. And, since today is One Flower Wednesday over at Journey of a Quilter, I made a mug rug that has a hexagon flower on one half and a string block on the other half. I am just loving these string blocks. I sew them on pages from a Scribble Pad that I buy at the dollar store. There are 60 sheets for $1, and the paper is like a porous recycled paper. So when I sew on it the paper perforates so there really isn't any tearing to get it off. It just lifts off. And, I sew string blocks chain piecing style so they sew up quickly. String block quilts are showing up all over blog land, and I am truly addicted to them. Lovely! 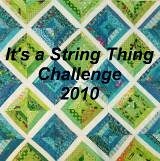 I'm going to shRe the link with our other HeartStrings quilters. Awesome! Your mug rug is so cute. Oh my goodness, your heart quilt is fabulous! Did you post it on Angela's blog list? Love the heart string design design! That is a great HS quilt pattern. Loving the reds with lighter creams and white fabrics. What a great quilt. Who would have imagined that a string block could be used in such a clever way. I have been following the Heartstrings ring looking at the quilts. YOURS ARE WONDERFUL. It looks like that's all you make. They are terrific. I like the hexie flower in the mug rug. I want to try some hexies and might be able to accomplish enough for a few mug rugs. Anything bigger in hexies seems to intimidate me. This quilt looks even better in person! You did a wonderful job with your heart quilt and the mug rug is too cute. It's looking so adorable thank you very much and many many congratulations because you have awesome talent.